Friday’s US session started in much the same way as some of the previous days this week: with US stock indices opening deeply in the red. After a bounce-back on Thursday, risk sentiment was hurt by disappointing earnings reports from tech giants Amazon (NASDAQ:) and Alphabet (NASDAQ:, ) and by 11:00 ET (15:00 GMT), the widely watched was trading off by 500 points once again. Then, traders suddenly started to bid up risk assets ahead of the European close. Whether Friday’s nascent recovery marks a meaningful bottom or merely profit-taking by bears ahead of the weekend remains to be seen, but we are seeing some technical signs that a near-term bounce in pro-cyclical assets like could be in play. 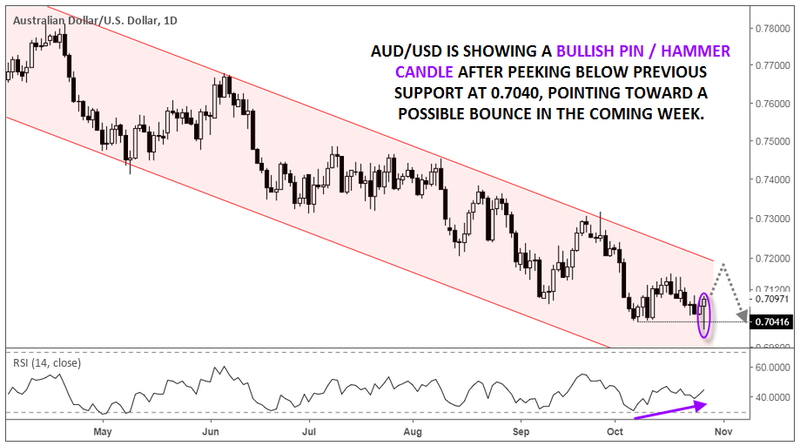 As we’ve noted repeatedly over the last few months, AUD/USD is in the “cleanest trend in the FX market,” with a well-defined bearish channel guiding rates lower since the peak in late January. After forming an “inside candle” Thursday, the pair dropped sharply early Friday to hit its lowest level in over two-and-a-half years, near the round 0.7000 handle. However, mirroring the price action in stock indices, the pair has reversed sharply off its intraday lows and is currently showing a large “bullish pin,” or hammer, candle on the daily chart. This pattern is often seen at near-term bottoms in a market and combined with the previous support from earlier this month around 0.7050, suggests that the pair could bounce back heading into early next week. To the topside, resistance sits around 0.7130 (this week’s high), followed by the top of the bearish channel just below 0.7200. As long as those levels cap rates, the longer-term momentum will continue to favor the bears. Meanwhile, a break and close back below 0.7040 would open the door for more weakness toward 0.6900 or lower next.